It’s an age-old saying in the internet marketing community, and truth be told, it holds a lot of weight… even after the rise of social media. In fact, email is 40 times more effective than Facebook and Twitter combined at procuring customers. Not only that, but people in the US are reading more marketing emails than ever and that includes millennials. A reliable, active email list is a true asset that you can use in a whole bunch of different ways to mobilize your audience to take some sort of action. Get attention to your discounts, deals, etc. And the best part? It’s almost free to do. Sure, you’ll have to pay your email company (we’ll give you some to use below), but the amount of revenue that you generate from your list will make that cost a speck in a sea of sand. This is your straightforward guide to building and using a list as an e-commerce store owner. All of the advice within is custom tailored for e-commerce specifically. If you own a store, read on. Setting up your own mailing server with a program like Interspire is one route to go… if you have a substantial enough list where the managed solutions cost too much. Most of us don’t. Most of us will save a ton of time and hassle by going with a managed solution. With these managed solutions, you can create lists, set up autoresponders, and do individual blasts all at once from a simple online dashboard. Aweber: most popular, very organized, extremely easy to use, tons of features, expensive. MailChimp: also popular, not as many features, requires more customization, slightly cheaper. GetResponse: worth mentioning, roughly same pricing as MailChimp. The one you end up going with will be based on personal preference as they each have their own advantages and disadvantages – at this point, don’t get too worried about which you choose as there will be developers who can help you with setting things up for all three. And almost all carts integrate with the reputable managed mailing solutions… especially with the three above. Pick one and sign up. You can always switch later. We’re going to be collecting emails from everywhere that we can. When someone makes a purchase (most important). When someone makes a contact form submission. When someone comments on your blog. When someone registers for an account. When someone visits your site. As an e-commerce site, one of the easiest ways to collect an email address is when a customer makes a purchase. 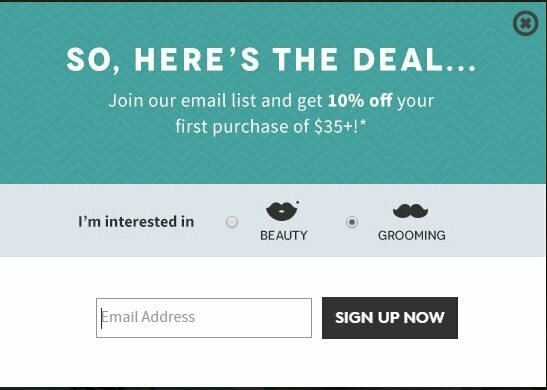 You can easily include a newsletter checkbox as part of the checkout process. The one thing that you’ll need to decide though is if you want an opt-in form or an opt-out form. An opt-in form has the e-mail subscribe option unchecked by default, where as an opt-out form has the e-mail subscribe option pre-checked by default. The advantage of using an opt-out form is you’ll grow your list at a faster rate, however it might be at the expense of quality leads which ends up making you spend more money on email marketing to subscribers that aren’t taking the actions you want them to take. This is something that you’ll want to test – if you aren’t getting a huge decline in quality leads with an opt-out form, then stick with it. Popups, when done correctly, can be an extremely effective method for collecting email addresses of potential customers browsing your products or reading your blog. In fact, in one test reported by AWeber, a pop-up box drove 1,375% more sign ups than a sidebar form. You’ll want to offer some sort of incentive, such as a discount or free shipping to motivate people to sign up. Note: After a user signs up, don’t just prove a ‘thank you’ popup. You have their attention, so it’s a perfect chance to lead them to a particular product page or offer with a call-to-action. 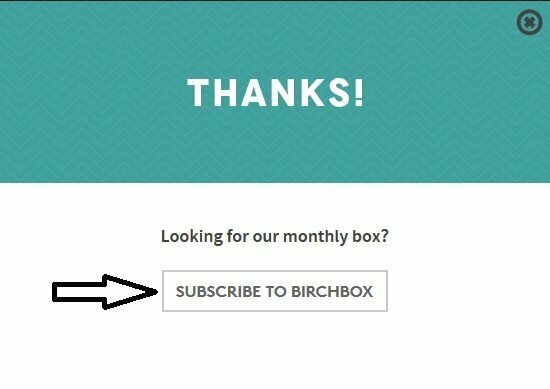 Check out the following example from Birchbox, after providing an email address to their popup box. 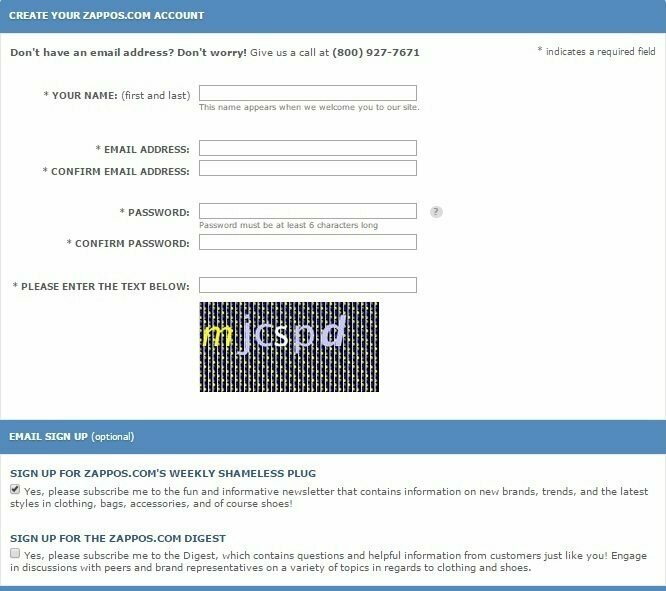 A subscription form in the footer is pretty much a given but make sure to use copy wisely so that you provide an incentive for your customers to sign up. Check out the first two examples, which are from Birchbox and The Gap, and then compare it with the third example from Express. An autoresponder is a series of emails that are sent to the subscriber in a delayed fashion. So when he or she subscribes, your subscriber may receive a welcome email. Then, three days later, they may receive a discount for 20%. Then, three days after that, they may receive a different email, etc. Welcome email sent from LuLu Frost after signing up. With an autoresponder, you can create a relationship with your customer without doing much work at all. Sure, you two are communicating in a one-way fashion, but if you can provide genuine value to him or her, he or she will be interested in receiving emails from you. Your autoresponders should be segmented by list in order to make each email as direct as possible. An autoresponder with a generic email subject like “20% off select items” might get a few opens, but don’t you think that these would get more? Subject to a subscriber that made a purchase: Need anything else from us? 20% off [category they purchased in] today. Subject to visitor that registered for an account: New member exclusive discount – 20% off everything. Each list gets its very own autoresponder series. Emails can be repeated, but each message on each list should be personalized depending on how you collected the email. With existing and new customers, it’s important that you to send all of the information as possible on the customer to your managed email solution – purchase amount, categories purchased in, etc. This will allow you to segment your customer list even further. And the more segmented your list is, the better each of your emails can be. For example, if you can determine which subscribers bought women’s clothing, you can send category-specific promos to only them. The majority of men won’t care about women’s clothing, and vice-versa, so you’ll just end up annoying them. Another example – if you can determine that the subscriber bought a coat in winter of 2012, schedule an email in winter of 2013 offering a discount to replace the old coat. Or, if the customer bought a watch under $50, follow up with slightly more expensive watches a month or two later. You get the point. The more you segment your list, the more creative you can get, and the more money you can make. You can have your email followup autoresponder be 100% promotional… but it’s always a good idea to show the customer that you are more than a discount machine, especially if the list is from your contact form or some other non-purchase source. Discount machines often get unsubscribed to unless the subscriber shops at the store a lot or the deals are really good. Linking to helpful content can increase your brand value to the user, too. They will look at your name in a different way if you’re both helping and selling to them. For example, if you have a clothing e-commerce store, in your autoresponder, send out a guide to your male customers (or those that purchased men’s items) on picking the right dress shirt type depending on his body type. That’s an email that can be used all year round, and all guys like to look dapper in their shirts. This is where the real, noticeable money comes in. Since all of your subscribers will be receiving your autoresponder messages at different times, your revenue from them will be slow and steady. One-time blasts, on the other hand, will make your charts spike in traffic and revenue because everyone is receiving and clicking at the same time. You should have a pretty accurate gauge on the countries of your customers by looking at your purchase stats – take the opportunity to capitalize on anything national in those countries. Holidays, sporting events, elections, pop culture – if it’s relevant to your products, find a clever way to make a promotional or valuable email out of it and send it out to your subscribers. You can, of course, personalize your one-time blasts by the information that you have on the subscriber. Make sure to do that – European customers aren’t going to feel that you’re a local brand if you’re sending them 4th of July discounts. As with our autoresponders, segmenting your list is vital. The more info you use, the higher your open rate will be because the emails will be more appealing to each subscriber on an individual level. Email marketing is a special type of marketing. With email, you are right in the middle of other important messages for the reader – with e-commerce email specifically, the name of the game is to get the subscriber off browsing email and onto browsing your store. Here’s a fact – unless you have serious subscriber dedication, you will have to catch the eye of your subscriber and get him or her curious enough in just a few words so that he or she opens the email. Keep it short. Mobile phones will only display a few words at most when a push notification is received, and over 65% of email is read on mobile phones. You want to let the user know as much as possible as quickly as possible. Make it informative. Creativity is great, but if the subscriber doesn’t know what the heck your email is about, he or she will not click (or open on his or her phone) to learn more. Remember, there are more pressing matters than your promotional email in the subscriber’s inbox and life. Make it urgent. If promotional, you want your subscriber to see the subject line and click it out of fear that he will miss out on a great deal. This helps you get opens when the subscriber is on the move, busy, or just tired and has to decide if your email is even worth the hassle. If you got the open, you have an inkling of interest from your subscriber. That’s good. We want to take that inkling and simply direct it at our websites. Our sites are going to sell the merchandise – our lists are just in charge of funneling users from email to product page. Keep that in mind and make it snappy/alluring. All of the managed solutions that we linked you to at the start of this guide will be able to track opens and clicks for all of the emails you send out on both your autoresponders and one-time campaigns. Use this information to see what’s working and what’s not. Is humor increasing your open rate? Do longer email messages with more pictures result in a higher CTR? Remove your duds, replicate your successes, and don’t forget to optimize your successes through split testing to make them even better. Remember, more opens and clicks per email means more traffic. And if your site is set up properly for conversions, your revenue will go up. Continue optimizing and you may find yourself able to increase the average customer value far beyond what you were aiming for. Each successful split test is a backbone for future profit. Send out personalized one-time emails based on regional events, holidays, etc. Gee… five bullets? That’s not too bad. It’s a bit of work, but as we said at the start of this guide, the work will pay for itself almost immediately. If you don’t believe us, sign up for a managed email solution, import your current customers from your cart, and send out just a single email. See how many clicks, opens, and conversions that you get. Chances are, the numbers will blow your mind, and you won’t need any further coercion from us to get your email campaigns up and running. You’ll be able to repeat that single email on autopilot week after week. If you do it right, it’s like printing money. As an e-commerce store owner, list building and optimizing your mailing funnel should be on the top of your priority list.